Linda G. Griffith, PhD, is the School of Engineering Teaching Innovation Professor of Biological and Mechanical Engineering and MacVicar Fellow at MIT, where she directs the Center for Gynepathology Research and the “Human Physiome on a Chip” project supported by the DARPA/NIH-funded Microphysiological Systems Program. Dr. Griffith received a Bachelor’s Degree from Georgia Tech and a PhD degree from the University of California at Berkeley, both in chemical engineering. Dr. Griffith’s research is in the field of regenerative medicine and tissue engineering. Her laboratory, in collaboration with J. Upton and C. Vacanti, was the first to combine a degradable scaffold with donor cells to create tissue-engineered cartilage in the shape of a human ear. The 3D Printing Process she co-invented for creation of complex biomaterials scaffolds is used for manufacture of FDA-approved scaffolds for bone regeneration. She is also contributed new concepts to nano-scale biophysical control of receptor engagement by biomaterials, and has developed and commercialized a microfluidic multi well bioreactor for 3D culture models of liver and other tissues. She is a member of the National Academy of Engineering and the recipient of a MacArthur Foundation Fellowship, the Popular Science Brilliant 10 Award, NSF Presidential Young Investigator Award, the MIT Class of 1960 Teaching Innovation Award, Radcliffe Fellow and several awards from professional societies. She has served as a member of the Advisory Councils for the National Institute for Dental and Craniofacial Research and the National Institute of Arthritis, Musculoskeletal and Skin Diseases at NIH. As chair of the Undergraduate Curriculum Committee for Biological Engineering at MIT, she led development of the new Biological Engineering SB degree program, which was approved in 2005 as MIT’s first new undergraduate major in 39 years. 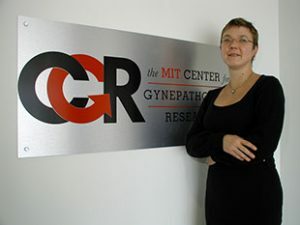 Her recent work in endometriosis has been recognized by the Office of Research on Women’s Health at NIH, where she was selected to give the first1st Ruth Kirschstein Memorial Lecture (2010) as well as the Endometriosis Foundation of America, where she was the Blossom Ball Basic Science awardee (2010). Prof Linda Griffith at CGR core facility.